I’m back from a fab ski trip in Utah. Thanks to the sale at a local sports shop I was able to wear a new pair of ski socks every day at a very reasonable price. After almost 24 hours of travelling I arrived at Gatwick airport at 10 AM, went home, had a nap and then had to do my one-man show that night. 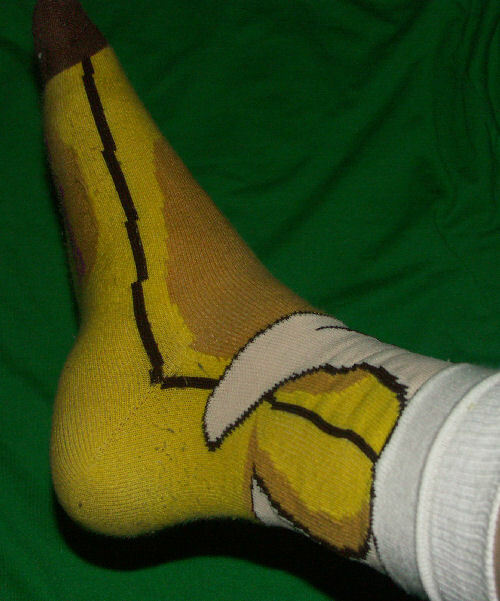 I knew it was going to be tough so I wore a pair of Big Banana Socks from the Sock Shop. Despite my exhaustion I was quite wonderful (if I must say so myself) and I think a small part was due to these outstanding socks. Speaking of the Sock Shop, Mikhel Ruia SC’s marketing director has graciously sent me a hole bunch of socks in the post. Soon I shall be reviewing each and every one. This entry was posted on 26,February, 2008 at 8:48 pm and is filed under Uncategorized. You can follow any responses to this entry through the RSS 2.0 feed. You can leave a response, or trackback from your own site.